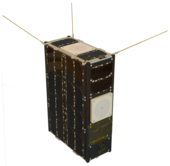 Ready to be launched with its counterpart from China on 2 February, GomX-4B is built from six standard 10 cm CubeSat units. Much quicker to build and cheaper to launch than traditional satellites, ESA is making use of CubeSats for testing new technologies in space. The main goal is to test the radio link at varying distances, routing data from one satellite to the other, then down to the ground. GomX-4A, from the Danish Ministry of Defence, will remain in position while ESA’s GomX-4B manoeuvres up to 4500 km away. Supplied by Swedish firm NanoSpace, the thrusters fitted along one side will allow it to adjust its motion by a total of 15 m/s – a speed equivalent to a kicked football. “We have two pressurised fuel tanks linked to two pairs of thrusters,” explains Tor-Arne Grönland, head of NanoSpace. “Rather than burning propellant, these are simpler ‘cold-gas’ thrusters designed specifically for such a small mission. And simpler means cheaper and smaller. “The fuel is stored under pressure, then released through a tiny rocket nozzle. Even though it’s cold gas, we achieve a substantial velocity change by using liquid butane that turns to gas as it exits. Each thruster will provide only 1 millinewton – the weight you would feel holding a feather in your hand – but enough to move the 8 kg satellite over time. The thrusters will typically be fired in pairs although they can also work individually, for a few minutes at a time and up to an hour. “Compared to a typical half-tonne satellite with 1 N hydrazine thrusters, we are almost a hundred times lighter and a thousand times weaker,” adds Tor-Arne. NanoSpace already has flight experience behind its cold-gas thruster, with a smaller version carried on China’s TW-1 in 2015. NanoSpace began as a commercial spin-off from Sweden’s University of Uppsala, and was acquired last year by Danish company GomSpace, builder of the GomX-4 satellites. 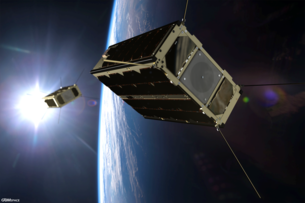 The companies are currently working together on a constellation of more than 200 CubeSats for a commercial customer.